I find no shame in admitting I love the circus. Off the top of my head, I can recall only three circus-themed films: 1952's surprise Best Picture Winner The Greatest Show on Earth, the 1967 Joan Crawford vehicle Berserk!, and 1932's bonkers but brilliant Freaks. Now I can add Water For Elephants, based on the Sara Gruen novel. In a curious way, I find that Water For Elephants can be a combination of all three. Jacob Jankowski (Robert Pattinson) is about to start his finals exam to be a veterinarian when he is told that his Polish-born parents are dead (their origin will be important later on). With no money and the nation in the grips of the Great Depression, Jacob hits the rails, catching a ride on the Benzini Brothers Circus train. Taken under the wing of old roustabout Camel (Jim Norton), his veterinary skills soon attract the attention of Ringmaster/Owner August Rosenbluth (Christoph Waltz). August, in a private rivalry with his nemesis the Ringling Brothers Circus, is impressed with Jacob's skills with the animals although he has an odd way of showing it, and is far more impressed that Jacob is a Cornell graduate (or almost graduate). Soon, he puts Jacob in charge of the animals. The Benzini Brothers central act is Marlena (Reese Witherspoon), who first rides the horses but can't due to Jacob having to put one of them down. Marlena, who is also August's wife, is soon persuaded to ride a new attraction: a pachyderm named Rosie. Soon, Jacob and Rosie bond, and if you can't figure out that there is going to be a love triangle, then really, where is your sense of predictability? The whole story is book-ended by Old Jacob (Hal Holbrooke) serving as narrator to another circus manager/owner, Charlie O'Brien III (Paul Schnieder). Here is one point where Water For Elephants went wrong: the Titanic-like framing story. As much as I may quarrel with Titanic, at least there was A reason to have the framing device; not the best or brightest, but that is for another day. With some exceptions (Sunset Boulevard, Blade Runner) I'm not big on voice-over narration, and especially in the way it was handled here. We start with Holbrooke narrating the story behind the Benzini Disaster of 1931 (the date is also important) then slip to Pattinson narrating the story using the same words. First off, I didn't think the framing device was even needed since the story is pretty self-explanatory. Second, why did the Old Jacob have to segway to the Young Jacob telling the Old Jacob's story? If one thinks on it logically which is what I try to do at any movie, the Young Jacob couldn't possibly know the future which is the Old Jacob's past, correct? Finally, there are long stretches where there is no narration, so when it comes back, it is not only distracting, but makes one wonder if Young Jacob or Old Jacob should be telling you this story. Another curiosity from the script is the Polish pachyderm bit. What exactly are the odds that a Polish-comprehending elephant would exist in America and have a second-generation Polish-American come around to find her? I don't know if it came from the novel or the screenplay but it does stretch believe-ability (especially since we never learn exactly how Rosie come to understand Polish). Also, perhaps as a side note: assuming Water For Elephants' framing story takes place today, in 2011, that would mean Old Jacob is remembering events that happened eighty (80) years ago. If we give Young Jacob's age at the time of the main story as twenty (20), that would make Old Jacob at least 100 years old. If we give Young Jacob Pattinson's actual age as of today (24-25), that would mean Old Jacob is wandering around a circus at well over a hundred years old. This might be a compliment, but Hal Holbrooke looks nowhere near 100 years old either in real life or in Water For Elephants: he looks every bit his 86 years. Therefore, if you do the math, both Jacobs don't appear to fit well in the story. That really is just being a bit picky. Going over the actual acting, we can pretty much dispense with Holbrooke, who is not in the film nearly enough to register in one's memory. I have worked hard to be charitable towards Pattinson (I am one of the few people who liked Little Ashes, though Pattinson didn't do a great job there). However, as in those Twilight movies, and as in Remember Me, Pattinson just can't seem to act. His performance appears to consist solely and exclusively of pouting, looking lovely, and whispering his lines, shifting his eyes this way and that. I didn't get a sense of this young man's devastation at the death of his parents or the burning passion for Marlena because Pattinson had the same model-ready expression throughout Water For Elephants. I can't hold director Francis Lawrence at fault for Pattinson's lack-of acting. I can hold him at fault for what he did to Witherspoon and Waltz. You have two Oscar-winners who were wonderful in their prize-worthy performances (Walk The Line and Inglourious Basterds respectively) but in this film, both were remarkably one, OK, sometimes two-note. Witherspoon was forever forlorn as Marlena, but the character never came to life; it almost looked like Reese was channeling Robert's acting style so as to not stand out. She was remarkably passive in Water For Elephants and could never bring a display of love to either man or beast. Waltz appears to be doing the acting for two by being Hans Landa's long-lost American cousin. When he raves and rants, which he does often, he raves and rants with gusto. When he menaces, which he does, he does with glee. When he brutalizes people and animals, which he does, he holds nothing back. August early on appears to be either sadistic or crazy, and it brings to mind those old-style melodramas where one started booing as soon as the villain showed up. Even the smaller parts, like the wizened old roustabout or the midget who becomes Jacob's friend appear to be cliches. Whether this is a result of the source material or Richard LaGravenese's script I cannot say, not having read the novel, but a lot of the story doesn't make sense. For example, if August has a nasty habit of flinging roustabouts out of a moving train so as to not pay them when he has no money, you'd think those still around and alive who are not allied with him would have run away, or at least had some kind of uprising. Instead, they take it all rather submissively. Granted, in the Depression jobs were hard to come by, but there is a difference between a job and your life. A sadder part of Water For Elephants is that for all the trappings of the most spectacular show on Earth (wonder why they didn't use another phrase), we don't really get much of the actual circus. There are a few montages, and they, along with the film itself, are beautifully photographed by cinematographer Rodrigo Prieto. There are moments of great lushness and beauty albeit crushed by James Newton Howard's grandiose score. However, what great moments of magic the circus sequences could have brought to the film were downplayed in order to get to the love triangle. In fact, the circus itself is almost secondary to Water For Elephants. As a side note: whatever criticisms The Greatest Show on Earth has, some of it valid, at least that one moved and was entertaining, two things that can't quite be said about Water For Elephants. I bring up The Greatest Show on Earth because Water For Elephants reminds me so much of it. You have a circus setting, love triangles, and even a closing 'disaster' complete with wild animals although the climatic disaster in The Greatest Show on Earth was far more exciting. In fact, the Benzini Disaster had me thinking of the big moment in The Greatest Show on Earth so much that I thought the latter inspired the former. As for the fate of August, not to give it away, but not since we discovered who was the murderer in the Sherlock Holmes story Silver Blaze have we gotten such a surprising killer. 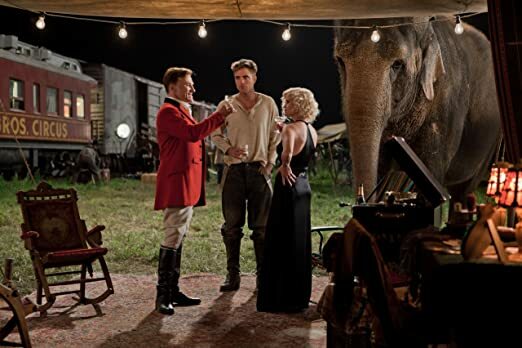 Water For Elephants is certainly trying to be very romantic, lush, a film to sweep you into a now-lost world of circuses and true but forbidden love. It is unfortunate that it is also remarkably bland in execution. 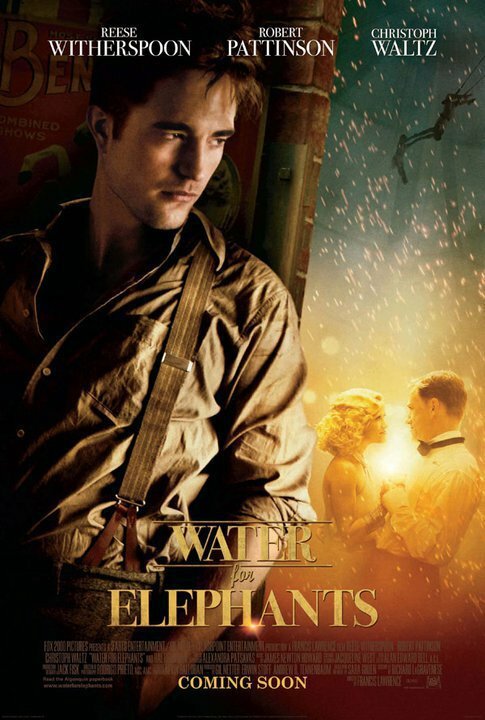 Ultimately, Water For Elephants is like Robert Pattinson: very pretty to look at but not having much depth within it.